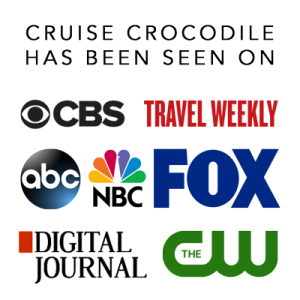 Our Cozumel cruise port guide gives you information about the docking location, cruise dock, transportation options and much more! 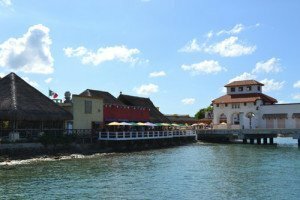 Welcome to the Cozumel Cruise Port Guide. Cozumel is the largest Mexican island in the Caribbean Sea. The main town on the island is called San Miguel. The island lies 19 km / 12 miles in front of Playa del Carmen on the mainland. Cozumel is a perfect destination for those looking for beaches, shopping, scuba diving and snorkelling. But for those interested in history instead of beaches you are at the right spot as well! The island has a number of Mayan ruines like San Gervasi and you could even visit the famous Chichen Itza when your ship is in port in Cozumel. This is where the cruise ships dock in Cozumel. 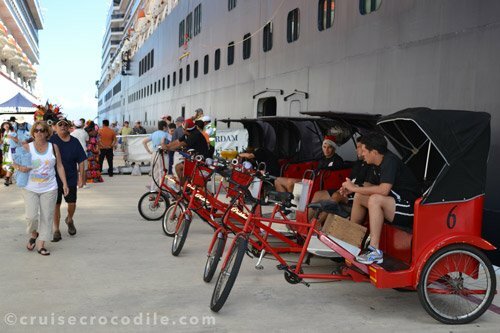 In front of the cruise pier you will find a cruise terminal offering all the facilities you want. The fun starts on the pier at Cozumel! At the Cozumel cruise dock you will find a variety of transportation optics like these shuttle rickshaws at the dock and taxis at the cruise terminal. Negotiate a price before you step in. These cruise docks are about 1/2 mile away from each other (see map above). The dock is about 5 miles south of the main town San Miguel. Here you will find a large cruise centre with all you cruise, shopping and tourist facilities right there! Find well known retailers as Del Sol, Diamonds International and Piranha Joe’s right there at the cruise centre. You will even find a pharmacy, convenience access and a special excursion pier here. If you don’t want to stick around the cruise centre you can take a taxi south (5 minute ride south) to the beaches, beach clubs and marine park. You can also take a take north (10 minute ride) to the downtown shopping area. This dock is located in the city centre of San Miguel. From here it’s a pretty 1,5 mile walk to the city’s bars, restaurants and downtown San Miguel along the nice waterfront promenade. Some of the things to do is the San Miguel Walking Tour and of course shopping should be on your list as well! At about 10 minutes drive you will find the Chankannab National Park as well as several beaches. At less than 5 minutes you will find the Playa Azul. Car Rentals can be found at 5 blocks from the pier you will find a car rental (Smart Car and Alamo). This actually means you wont be docking at all, but you will tendering. Often the San Miguel pier is used as a tender pier. This is also the pier of the ferry’s between Playa Del Carmen and the island. There are plenty of taxis here and you are within easy walking distance to shopping, restaurants and bars. You can take a ferry to the mainland at the San Miguel Passenger Ferry Pier in downtown San Miguel. The crossing takes about 45 minutes. Ferries go about every hour. Keep in mind the schedule could change without notice. Tickets cost between around 12 US dollar per adult and 7 US dollar per child. The cruise dock of Punta Langosta is the most Northern cruise dock on the island. From here it is about 1,5 mile walk to the city center of San Miguel, but you will find lots of facilities like restaurants, bars, shops and car rental near the cruise area. Read the full Cozumel cruise port guide for all the information. Cozumel offers several docking locations for cruise ships. Puerto Maya & TMM cruise pier is one of those locations. It is the most southern dock of all. They are located at about 5 miles south of San Miguel. 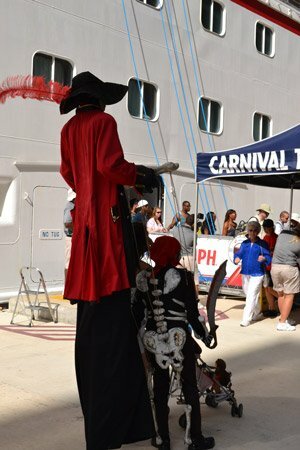 You will find these cruise docks offer great services in the cruise terminal in front of the dock. 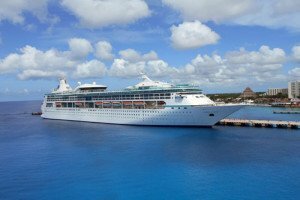 Visit the Cozumel cruise port guide for all the information.